Why do we Dry Grain? When grain is harvested it is in the best condition it will ever be. It can only go into worse condition. Drying will increase the storage life of harvested grain. 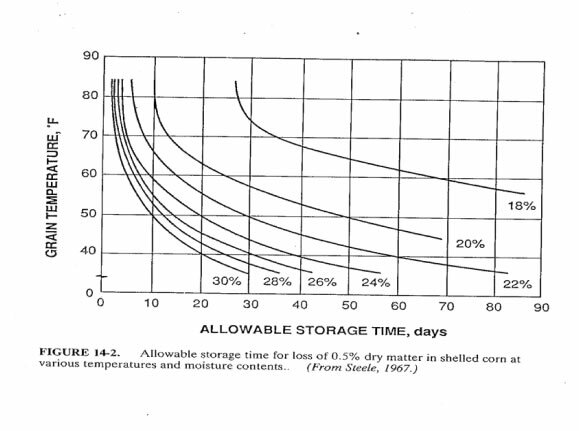 Shelled corn storage time for 0.5% dry matter loss(days). 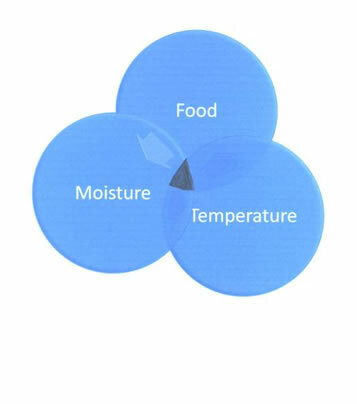 Moisture values are for good quality grain that is aerated to control temperature. Reduce moisture content by about one percentage point for grain that has low quality at time of storage. The longer we wish to store grain the more important it is to get the grain to a moisture level that will prevent spoilage. Drying involves driving out the moisture trapped inside the “seed coat” or skin. Moisture can migrate in both directions. Over drying or drying to quickly will cause stress cracks in the seed coat. These cracks can lead to broken kernels and more fines in storage. Cracks can also lead to easier access for molds and insects to the seed interior. Rice drying small increments (2% at a time) then steep and temper. Repeat. Aeration – While not a form of drying is essential to the drying process. It is simply forcing air through the grain mass to maintain condition. Natural Air Drying – Is the use of outside ambient air without the addition of heat. Airflow is the amount of air passing through the grain mass. It is a volume of air crossing a volume of grain in a given time period. Airflow is usually measured in cubic feet per minute per bushel or cubic meters per minute of air per cubic meter of grain. 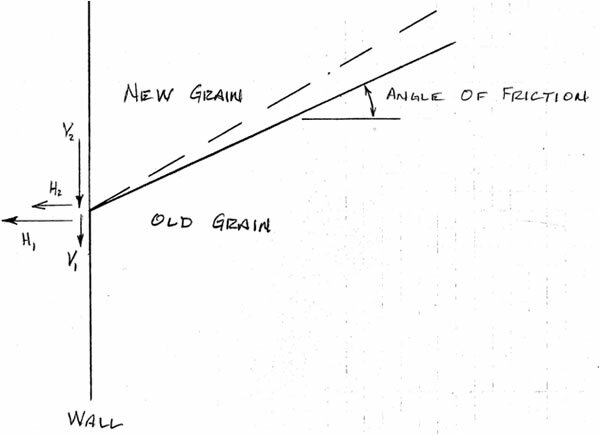 Airflow is the amount of air passing through the grain mass. It is a volume of air crossing a volume of grain in a given time period. Airflow is usually measured in cubic feet per minute per bushel or cubic meters per minute per cubic meter. 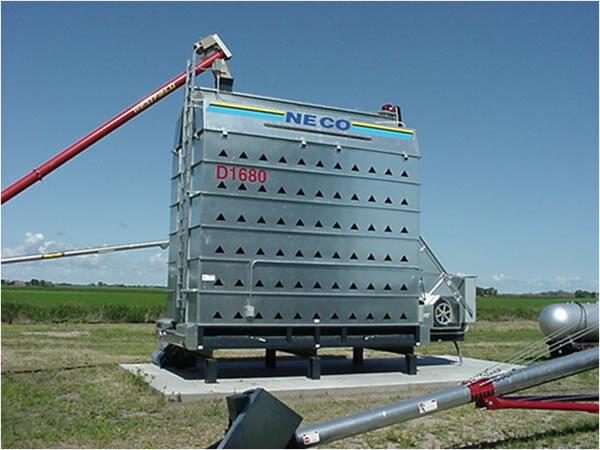 Airflow requirements depend on silo usage. Aeration can run from 0.10 cfm/bu [0.08 cu m/cu m/min] in large commercial silos to 4 cfm/bu [3.2 cu m/cu m/min] in natural air drying. Airflow is dependent on the “static pressure” of the grain. 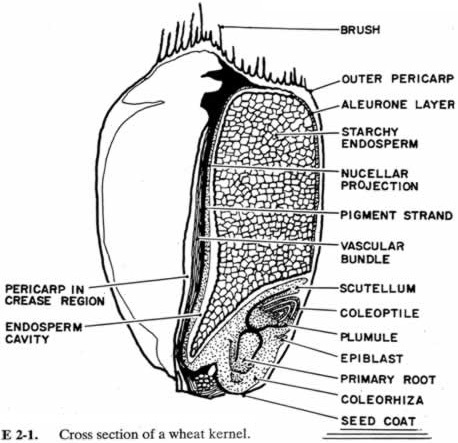 Air traveling in the voids between kernels of grain lose energy due to friction and turbulence. This energy drop or pressure drop is what we relate as static pressure. In general, the taller the silo and the smaller the grain kernel, the larger the static pressure. Fans force air through the grain mass. There are two (2) basic types of fans. Axial flow fans and centrifugal fans. 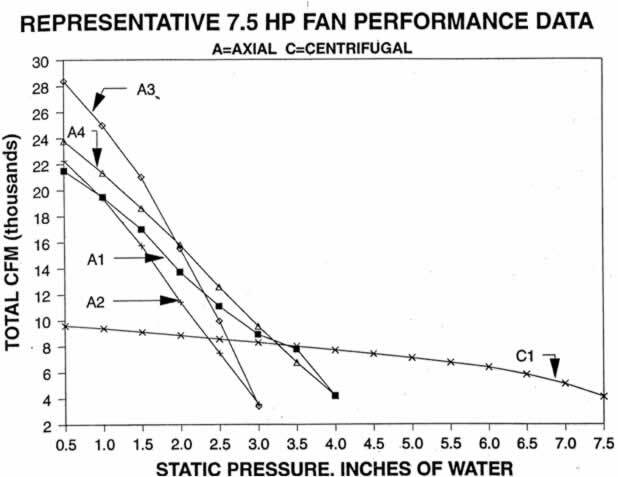 Axial fans produce more air flow at lower static pressures than centrifugal fans. Centrifugal fans work better at higher static pressures and are much quieter than axial. Fans can work either forced air or suction. We only recommend forced air systems in silos as suction systems can cause damage. Natural Air Drying is a process used to dry grain by forcing unheated air through the grain mass until the grain comes into equilibrium moisture with the outside air. 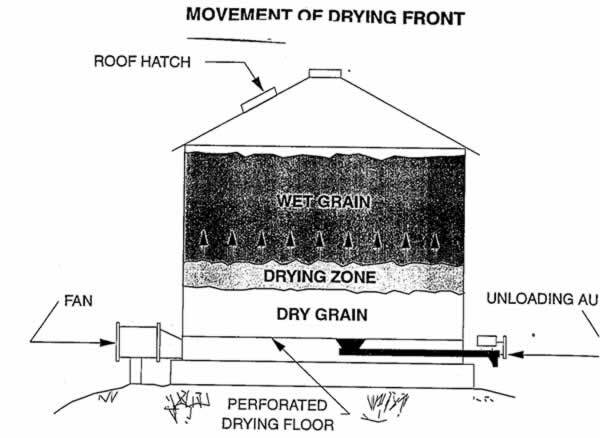 Drying with natural air can be accomplished only if the air temperature and relative humidity conditions allow a net moisture transfer from the grain to the air. 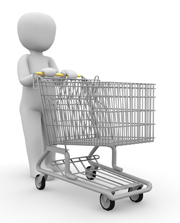 Generally natural air drying requires large volumes of air and a long periods of time. That is 1-5 cfm/bu [0.8 -4 cu m/cu m*min] and in most cases more than 30 days. Natural air drying is not something that will work in commercial silos or situations. It is restricted to farm silos 48’ [15 m] and smaller. Boxed areas indicate moisture contents usually considered safe for long-term storage. Conditions to the left of the boxes represent overdried grain while those to the right will require additional heat supplied to the air for dryhing to safe long term storage. Relative humidity is one of the major factors in drying. Air at 100% RH will not hold anymore water. The warmer the air the more water it will carry. If the air temperature is raised about 10 degrees F [6 C] the RH is halved or the warmer air will carry twice as much water. As air passes the grain and absorbs moisture it will become saturated (100% RH). The drying air will take this moisture from a narrow band in a silo. We call this a “drying front”. In temperate climates with cool to cold winters the grain needs to be cooled with the decreasing temperatures of winter. As the average outside temperature cools by 10 degrees F [6 degrees C] the temperature of grain needs to be dropped by starting the fans and cooling the grain inside. The length of time (in hours) the fans need to run can be calculated by the equation 15/(cfm/bu) (produced by the fan(s)) [12/(cubic meters/minute*cubic meters)]. 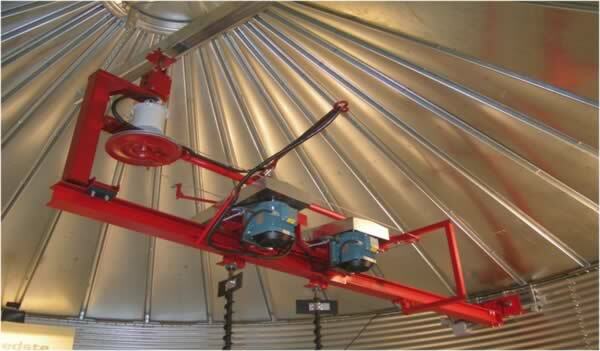 Example: We have a 20 Hp NECO centrifugal fan used on a 60’ [18.3 m] diameter silo by 12 rings tall [9.8 meters tall]. Time to move cooling front = 15/0.18 = 83 hours or 3.5 days. Note: Airflow calculations are based on the American Society of Agricultural Engineers. 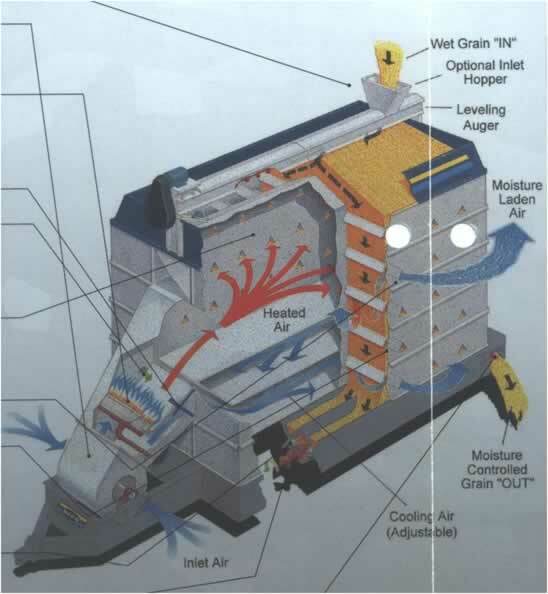 Standard ASAE D2723, "Resistance to Airflow of Grains, Seeds, Other Agricultural Products and Perforated Metal Sheets" and individual fan performance data. Actual rates and performance may vary. The fans need to be run continuously to drive the “cooling front” all the way through the grain. This only an estimate of the time required. Using a thermometer on a stick, that can be driven into the grain pile, the actual temperatures can be checked at different levels to determine if the front has moved all the way through. This process will need to be repeated each time the outside air temperature drops 10-15 degrees F [6-8 C] until the grain mass reaches 32-35 degrees F [0-3 C]. Insect activities and mold growth slow or stop below 40 F [5 C]. Freezing of the grain is not recommended. The entire process needs to be run in reverse in the spring as outside temperatures begin to increase. The grain in the silo should be no more than 15 F [8 C] different than ambient. Cooling grain is probably not an option in tropical climates and other measures must be taken. Moisture control is the only choice to keep your grain in condition. Grain must be dried to a lower moisture content in tropical conditions than in temperate climates (corn 12-13%). If ambient air conditions will not allow the removal of moisture, it may be necessary to add heat. 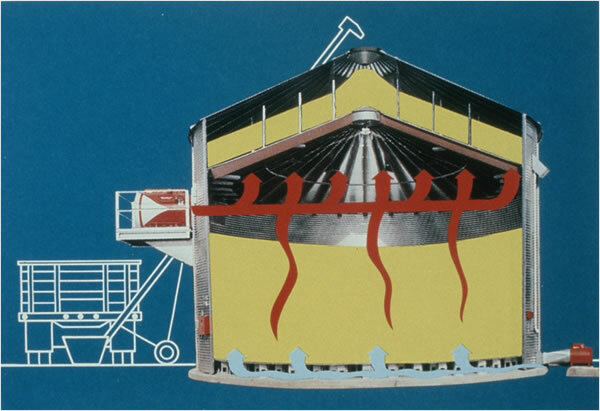 In cases where a “Hot Spot” cannot be eliminated by aeration it will be necessary to recirculate the grain. Moving the grain from one silo to another will break-up the spot and can allow for the introduction of pesticides or fungicides during the moving process. There are many different styles of mechanical dryer. Some like the screen (tower or stack) are cross flow design. 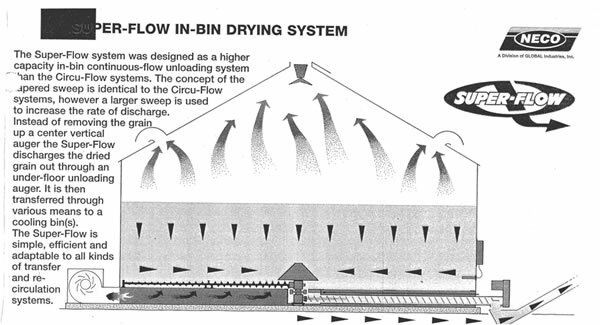 Some dryers are counter-flow where the material is moving one direction and the air is moving in the opposite direction. Most times we can dry to within 2 points moisture and draw the rest with the cooling process or aeration. 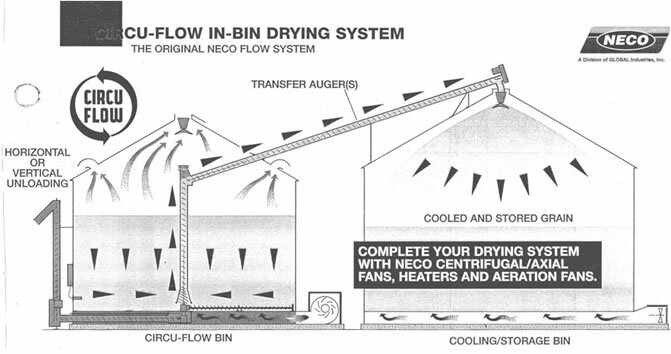 NECO produces a mixed flow commercial dryer. Can be done with just a fan for natural air drying. Add a heater to the fan and dry. Best if done with low heat and/or layered drying. 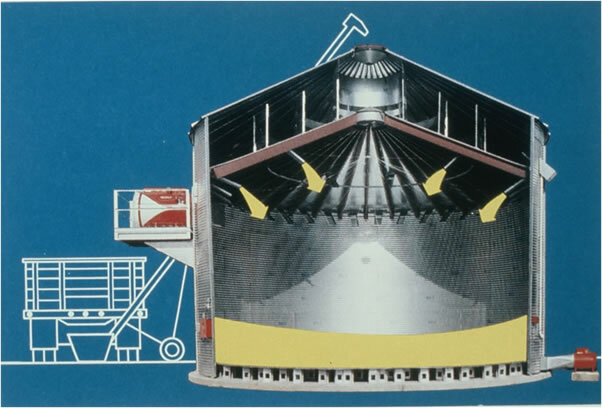 Mechanical systems added to silo; such as a stirring machine, recirculator or a continuous flow unloading system. •Can be done with just a fan for natural air drying. •Add a heater to the fan and dry. Best if done with low heat and/or layered drying. 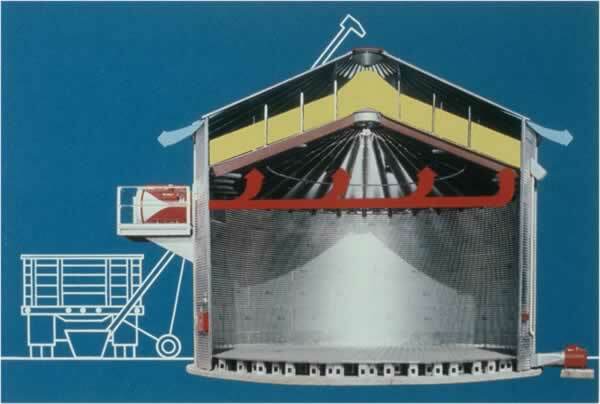 •Mechanical systems added to silo; such as a stirring machine, recirculator or a continuous flow unloading system. •Provides increased airflow. Less energy consumed by the fan to get the same results. •Prevents over-drying of the grain by mixing. •Moisture content of grain is consistent through the entire silo. •Drying makes two (2) major changes in the grain during the drying process. •Shrinkage –causes vertical forces on walls. •Lower angle of repose and Internal friction. •In some cases part of the silo is filled and dried and there is a break before any more grain is added. This dried grain has shrunk and the grain is putting the wall into tension. •The new grain needs to be dried and has a higher internal friction angle. This creates a point of discrepancy where these two layers meet. •This location may be where we see some of the recorrugations take place.